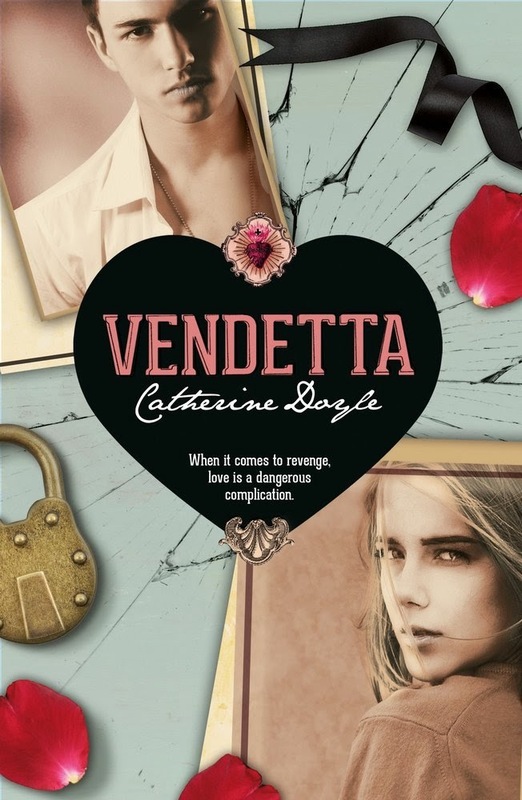 I really enjoyed Vendetta by Catherine Doyle. I was excited to hear that this is the first book in a planned trilogy which will be a modern-day retelling of Romeo and Juliet. Isn't that fabulous? I really do love these sorts of twists on a familiar story. And while I thought from afar, there are similarities to Romeo and Juliet that I could see, it also felt brand new and I felt like even if this story was following a set chain of events generally speaking, I was always constantly on the edge of my seat and also surprised by where the story went. So Vendetta is told from the point of view of Sophie, this teenage girl who has had her life changed quite drastically recently when her father is sent to prison. But despite that, Sophie is pretty determined to get on with her life, hang out with her best friend, and work in her family's diner. But her normal life is again shaken up by the arrival of a new family in town and Sophie finds herself irresistibly attracted to one of the five hot brothers. Getting to know Nicoli and his brothers means being pulled into something much bigger than a teenage crush and it has far reaching repercussions for both her and her family. One of my only real complaints I had when reading this book was the slow start. I felt like things took awhile to get moving for no real good reason. Plus, I knew beforehand (from the book summary) that this book would be about warring families and the mafia and it just needed to get there quicker. I really loved diving into this book and getting to know these characters though. I loved seeing the different sides to how both families are run and discovering all these massive secrets. There were a few gasp-worthy revelations and it really kept things interesting for me. I felt like maybe 2 of the brothers were unnecessary however and unless major things happened in future books only 3 were needed for the plot of this book. Still. I think with any Romeo and Juliet retelling the love and romance elements of the book have to be at the forefront of any book. And I found myself feeling quite a lot about pairings that don't happen in this book. Sophie does some really great kissing with a hot boy in this book but I'm really looking forward to these pairings possibly changing throughout the course of the book. I live in hope. I really wasn't too fussed when I first heard about this but everyone seems to have loved it so much that I'll have to get myself a copy.